Since it's finally getting... warmish out. 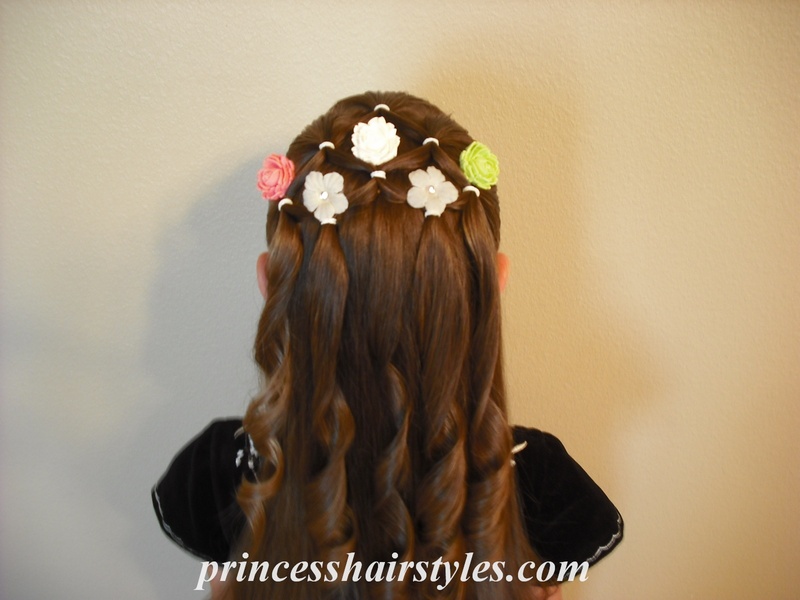 We wanted a fun flowery spring hairdo! 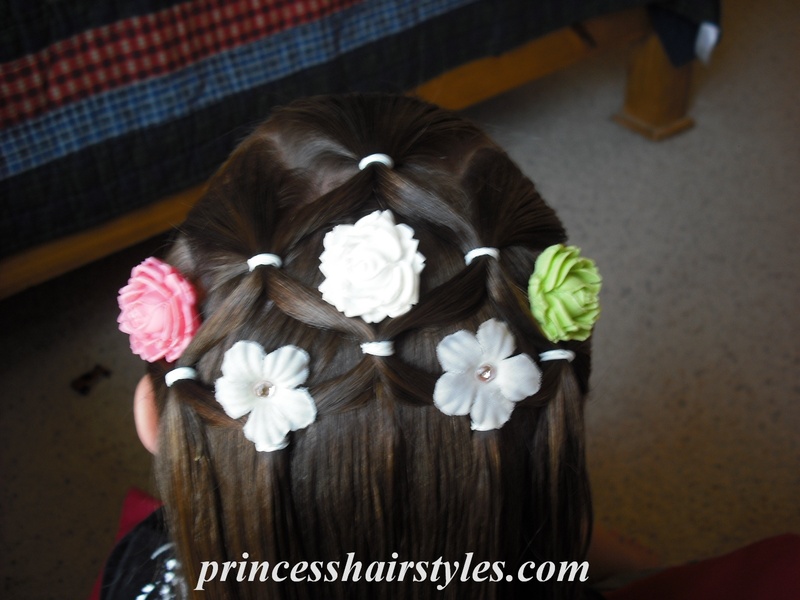 I think this would be a cute hairstyle for a spring wedding/flower girl, or just for fun. I realize this veil/elastic connector/spiderweb hairdo is nothing new. But I just loved how it turned out with the flowers!! I've found the easiest way for me to make the elastics even and symmetrical with this type of style is to make the ponytails in a certain order. I begin with the ponytail in the middle/front. 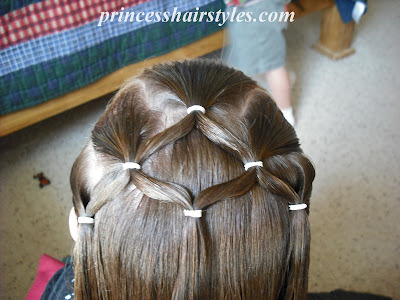 Split it in two and then work my way down both sides of her head before working on the middle. 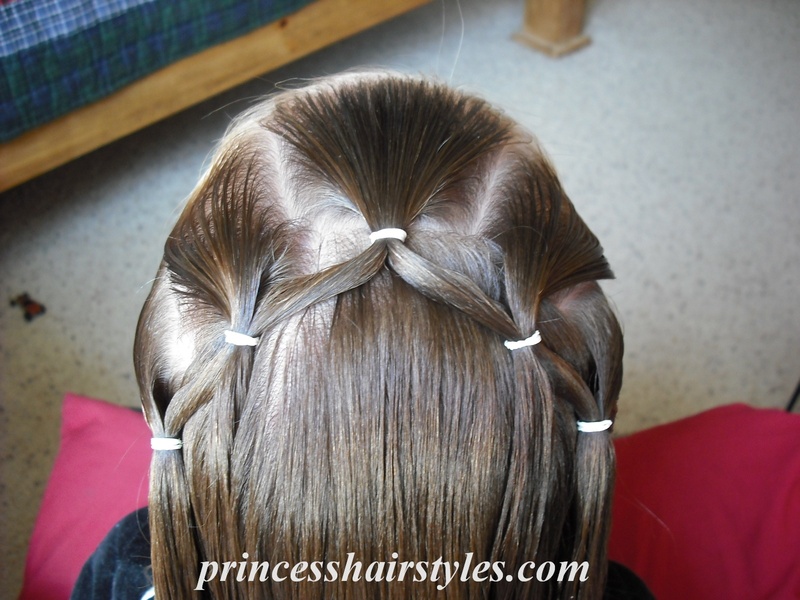 *Important: Notice that the second set of ponytails down (on both sides) are split in half and only one half is added in with the third set of ponies. Now for the fun part... adding the flowers! We used bobby pin flowers. These were quick and easy to add. I just stuck the bobby pins right through the back of the elastics where I wanted them to be. If you wanted to, you could use real flowers or fake flowers that aren't attached to bobby pins. I've added flowers to hairstyles before by simply wrapping an elastic around the stems. 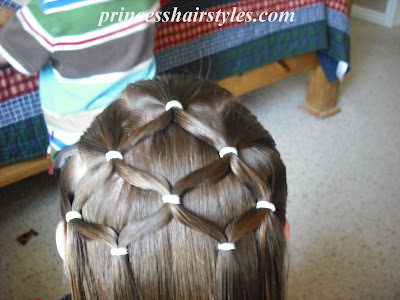 I thought of adding a few more rows of elastics, even going all the way down her hair. But we don't have that many flowers. I'm thinking of buying some more.!! Oh and of course we had to add some ringlets in the ponytails with our curling iron. This is beautiful! 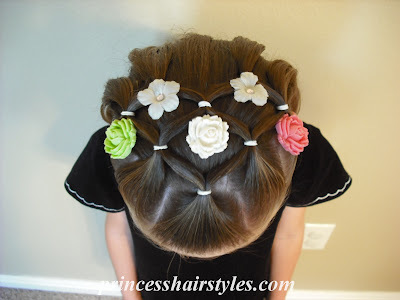 My little girl is going to be a flower girl in June and we will probably be using this hairstyle! Now I just need to find the right flowers. my daughter and i are loving your blog! she's actually letting me "do" her hair without screaming (kind of) ... thanks a million! Soooo pretty! I love it with all the flowers. Adorable! I like that I can do this even on my daughter's growing-out-A line-hair! Very creative--thanks! So cute! What kind of curling iron do you use? My mom and I really would like ringlets, but our curling iron just won't do it! I really like this one, especially since it would be so easy to co-ordinate with different outfits. Joy, Our curling iron is really old (I had it in high school.) I'm not seeing a brand name on it either. The barrel is really small if that helps. I would say the smaller the better when trying to make ringlets. I never do anything with my girls hair and one day we were looking at your blog together and my 8 year old was like mommy why can't/don't you do that. Honestly I cannot do anything with hair, can't even french braid, but I decided I would try some of the styles on here (the easy ones lol) and I've been fixing her hair for school almost every single day. A variation of this hair style (minus the flowers) in one of her favorites and I have you to thank! I love this one! It's so beautiful and the flowers are just the right size and so cute. I agree - perfect for spring! Wow! I can't wait until my baby girl's hair grows longer so I can try this! this is a great look! i may use it for my girls for my wedding this month! I think this is one of my faves! As a mom of one curly and one straight that BOTH have to be flower girls - I think this is PERFECT! Beautiful. It a=makes me want to have a girl. oh, that's adorable! 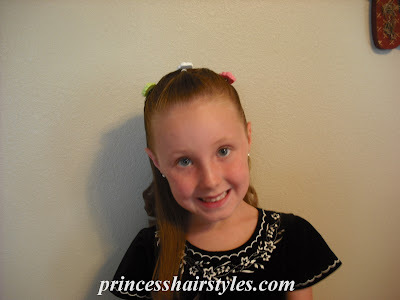 I can't wait until my daughter will sit still for hairstyles. She has so much hair for a 19 month old! Can any one here help me? 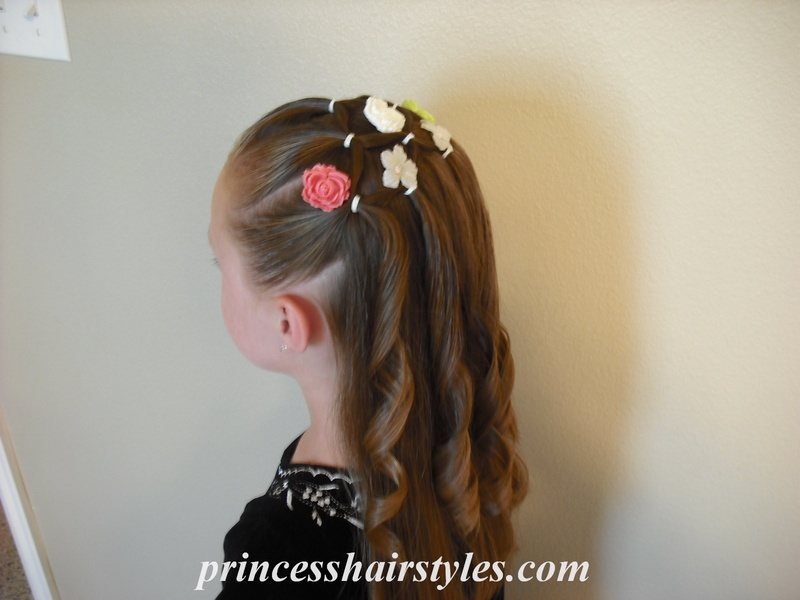 these hairstyles here are mainly geared for flower girls,but what about a baptism? my daughter is 12 going on 13,and recieving her sacrement of baptism this year at Easter vigil and per the parish dress code,all the girls have to wear a poofy white above the knees dress,with a bonnet,lace anklets and white mary janes.her hair is shoulder length and i need to know if there is a certain hairdo she should have with the bonnet? Or can she just wear her hair the way it is? Also,her and all the other girls baptized at easter vigil will make their First holy communions in may and i want to know also if the cloth diaper and rubber pants they have to wear under their baptism dress can be worn under her communion dress as well? To Anonymous february 17 post-Our daughter was baptized last year at easter vigil when she was 16 and had to wear the same outfit your daughter has to wear only white tights were required,instead of the lace anklets.Her hair is shoulder length also and she didnt do anything with it.she washed her hair and dried it then wore her bonnet with her hair sticking out from under it.most of the teen girls wore their hair that way,so i would just leave her her the way it is and put her bonnet on.All the girls baptized that day had to wear their baptism diaper,rubberpants,and tights under their communion dresses a month later for their first communions.I would say you should put your daughters baptism diaper and rubber pants on her also under her communion dress.it only makes sense for her to wear them. At our parish,the preteen and teen girls have to wear the poofy white top of the knees baptism dresses and bonnets with the lace socks and white mary janes with the cloth diaper and rubberpants under the dress also.For First Communion a month later,the baptism dress is required with a veil and the lace socks and white mary janes and the rubberpants are required with the diaper optional.